• The right outside rearview mirror is convex. Objects seen in the mirror are closer than they appear. • Use your interior rearview mirror or direct observation to determine the actual distance of following vehicles when changing lanes. The electric remote control mirror switch allows you to adjust the position of the left and right outside rearview mirrors. 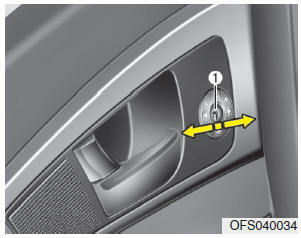 To adjust the position of either mirror, the ignition switch should be in the ACC or ON position, or engine is running. Push the switch (1) to R or L to select the right side mirror or the left side mirror, then press a corresponding point on the mirror adjustment control to position the selected mirror up, down, left or right. 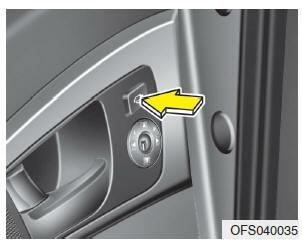 After the adjustment, put the switch into the neutral (center) position to prevent inadvertent adjustment. • The mirrors stop moving when they reach the maximum adjusting angles, but the motor continues to operate while the switch is pressed. Do not press the switch longer than necessary, the motor may be damaged. • Do not attempt to adjust the outside rearview mirror by hand. Doing so may damage the mirror. 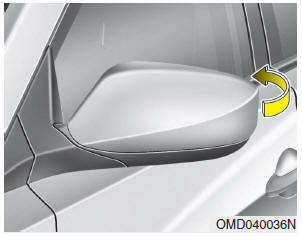 The electric type outside rearview mirror operates even though the ignition switch is in the LOCK position. However, to prevent unnecessary battery discharge, do not adjust the mirrors longer than necessary while the engine is not running.